This is a quick and satisfying pasta; one of those that you can make in the time it takes to boil water. Seriously. Choose a very fine, dry pasta, like capellini or angel hair. 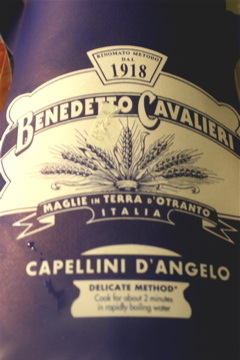 This is one of those ‘vanishing’ sauces, the sauce gets absorbed into the strands of pasta, so finer pasta will equal more flavor. Put a large pot of salty water on to boil. When the boiling water is just about to bubble, add ¼ cup good quality olive oil to a pan and bring to medium high heat. Add 6-8 anchovy filets; stir them around in the oil until they break apart. By now the water is boiling, add the pasta. 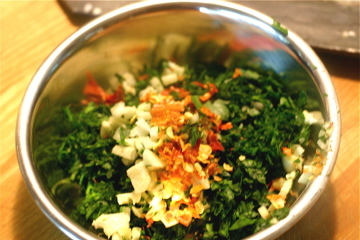 Add the chopped parsley, garlic and chilies to the anchovy oil; reduce the heat, because you don’t want the garlic to get all brown and bitter. Let the pasta cook for a minute, then take a ladle and scoop one ladle full of pasta water into the anchovy pan. Capellini will usually be done in about 2 minutes, if you are using a thicker pasta, allow more time in the boiling water. Drain the pasta and add to the anchovy pan. Toss the pasta and anchovy mix thoroughly and finish cooking the pasta (approx 1 minute). The noodles will absorb the extra water as they cook. 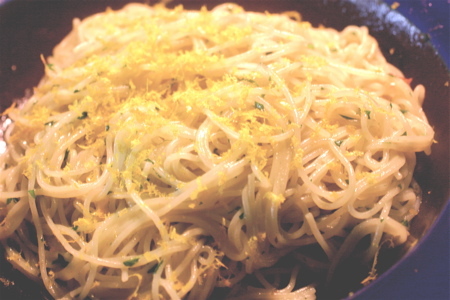 Plate the pasta and finish with a drizzle of olive oil and a bit of orange zest. Serve with a chilled white wine, or better yet, with a good rose`. Over on the "Every Kitchen Tells a Story" blog, Ruth is hosting a Presto Pasta event; so take a look at Ruth’s blog for other delicious recipes.